How do you know if your cultured cells are growing? Does your new cancer drug affect cell proliferation? What’s the effect of VEGF on endothelial cells? As you can tell, knowing how to perform cell proliferation assays is an absolutely essential skill for anyone in biology, biochemistry, or pharmaceutics. Radioactive Thymidine cell proliferation assays have been used since for over 40 years to detect whether cells are growing. 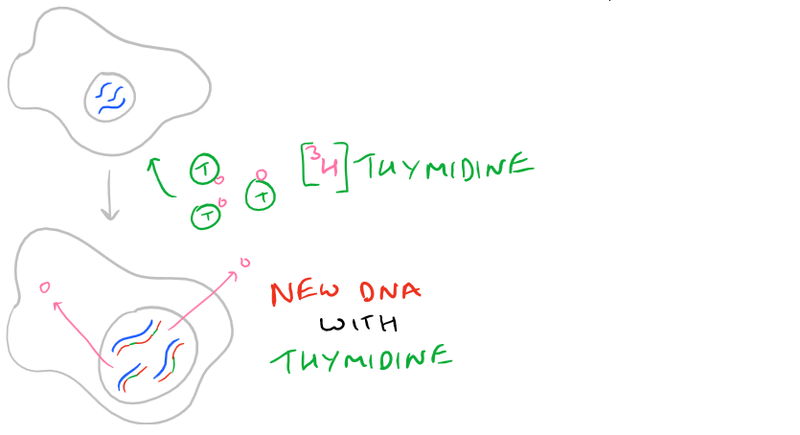 The principle is simple: cells will incorporate Thymidine into their DNA as they proliferate. 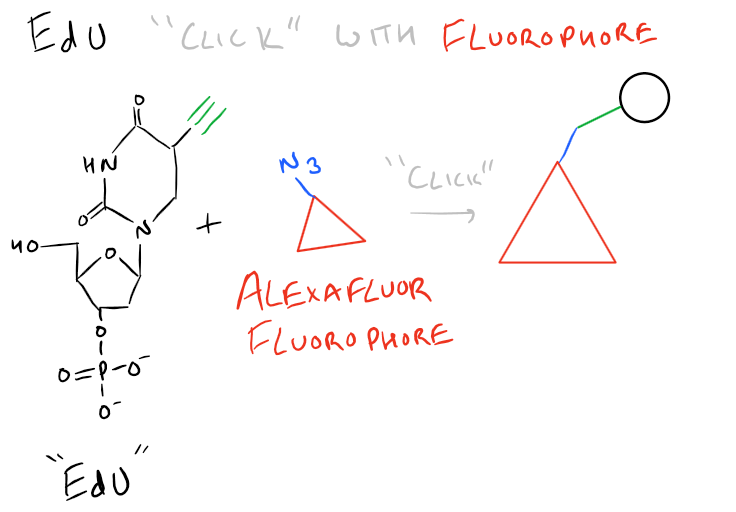 However, dealing with radioactivity is painful and annoying, so new fluorescence-based, non-radioactive, BrdU and EdU cell proliferation assays have become the new mainstay technique. These molecules are both thymidine analogs and hence work using the same principle as radioactive thymidine. In today’s guide, we will learn Step-by-Step, the theory behind these assays and how to apply them in the lab. 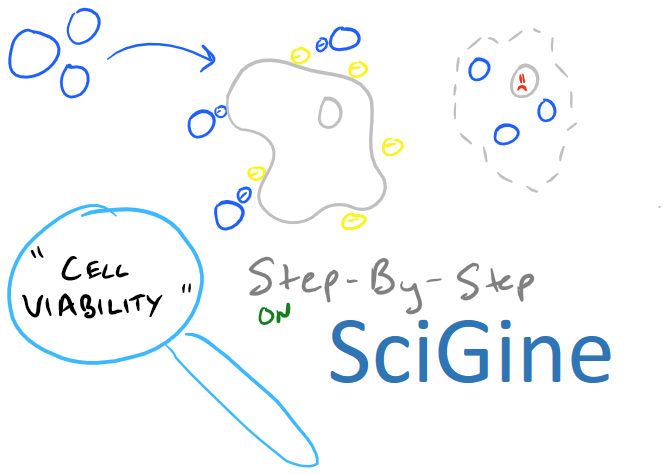 Combining our techniques of MTT Cell Viability assays and Flow Cytometry or FACS, we are really building up a great list of skills to analyze biological phenomena! 3H-Thymidine is a radioactive version of the Thymine DNA base (thymine + the sugar backbone = thymidine). When cells are incubated with thymidine, they use the radiolabeled thymidine to synthesize DNA and incorporate it into their DNA backbone. So, thymidine is an excellent measure of DNA synthesis in cells that have undergone the S-Phase of cell replication. Similarly, BrdU is a Thymidine analog that lacks the radioactivity from tritium and it is used identically to Thymidine. Just incubate cells in the presence of BrdU. However, unlike radioactive thymidine, BrdU is detected with Anti-BrdU antibodies. A quick summary picture is shown below. Taking things with a grain of salt: Note that DNA replication can happen even when cells are not proliferating. For example, if you have damaged DNA (ie. DNA repair is taking place). So, Thymidine and BrdU assays are really DNA replication assays and not perfect cell proliferation assays. But, for the most part, they are the gold-standard when looking for cell proliferation. Thick tissue sections? Choose your cell proliferation assay wisely: The 3H-Thymidine assay uses radioactivity. And the beta particles that are generated by this method cannot penetrate very deep into tissue. So, if you’re labeling tissue sections, make sure they are extremely thin! In these cases, BrdU is a great option because it penetrates deep into tissue and can be detected even from 50 um thick slices. This is illustrated below in the picture. Not enough signal? Add more: Since cells are substituting the radioactive thymidine into their DNA. Adding more thymidine means you’ll get more incorporation. And, more incorporation means you’ll get more signal! So, if your signal is low, just add more of the nucleotide. BrdU, however, doesn’t behave this way. There is a limit at which adding BrdU doesn’t increase your signal. Want to preserve your tissue? 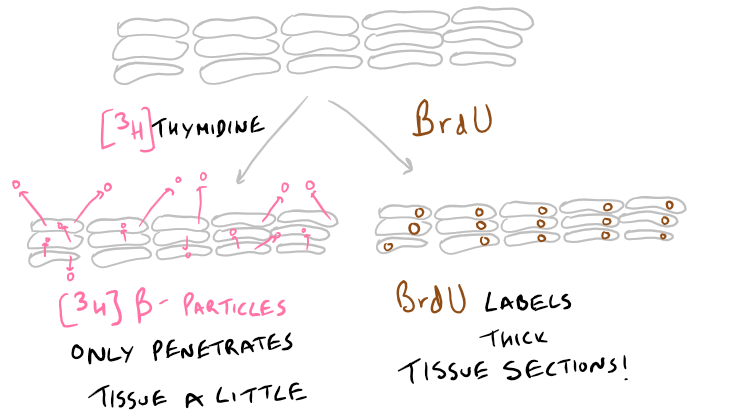 Use 3H-Thymidine: BrdU immunohistochemistry requires you to digest and disrupt tissue for visualization because the antibodies that detect BrdU need to access all the tissue. Detecting radioactivity just needs you to use a scintillation counter. You’ll want to refer to our Immunofluorescence microscopy guide and our Immunoprecipitation / CoIP Guide to understand this section better. Especially the bit about biotinylated antibodies and their detection. Demineralize tissue with demineralization solution for 3 weeks. Change solution 1x per day, everyday. Rinse sample tissues 3x with PBS for 60 minutes each wash.
Embed the tissues in paraffin and mount on slides. Make sure sections are less than 20 um thick. Air dry the frozen sections on the bench for 1 h.
Remove paraffin by dipping the slides in Histo-Clear and leaving them for 5 minutes. Repeat this once again. Wash sections 3x with 1x PBS for 2 min at a time. Rinse 3x with PBS for 2 min each. Make trypsin solution according to BrdU Staining kit and cover tissue sections. Rinse with PBS 3x for 2 min each. Add DNA denaturing solution and cover tissue for 30 min. Rinse off excess with PBS wash 3x for 2 min each. Then remove the PBS by blotting with tissue paper around the edges of the tissue. Add the blocking solution and submerge tissue. Add the biotinylated mouse anti-BrdU antibody and incubate for 60 min in the humid chamber petri dish. Add the streptavidin-peroxidase solution. Incubate for 30 min. Freshly make the peroxidase staining solution from the BrdU staining kit. Incubate sections for 5 min in this. Add hematoxylin staining solution for 1 min. Not more!. Quickly rinse with PBS 2 times for 30 secs. Dehydrate slides by incubating in 70% ethanol for 1 min. Then incubate in 95% ethanol for 1 min. Then incubate in 100% ethanol. Add Histomount media and put a coverslip on top. Use a normal brightfield microscope to image the cells. Make sure to check multiple vieweing areas to get a representative sample of your tissue. Demineralization finishes when the tissue is pliable and can be bent without breaking. Embedding tissues in Paraffin will be discussed later in another post. Staining with hematoxylin will make sections too blue and harder to analyze. Don’t leave in there for more than 1 minute! Normal cells that are dividing will have brown nuclei. 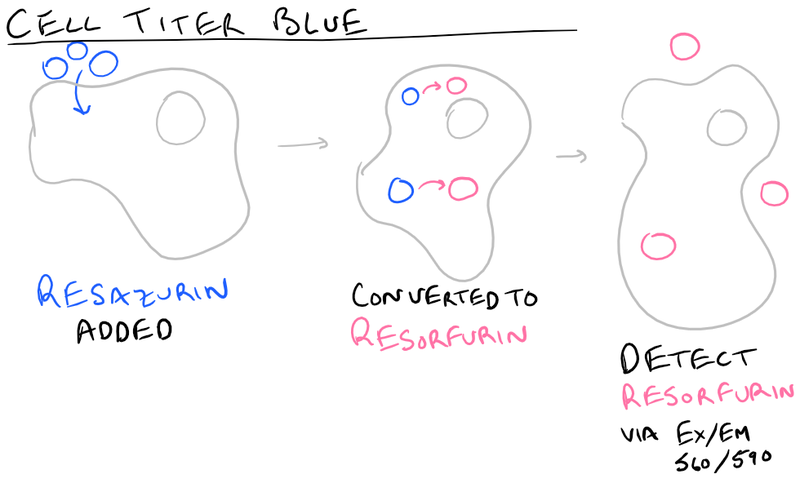 Non dividing cells will have blue nuclei. 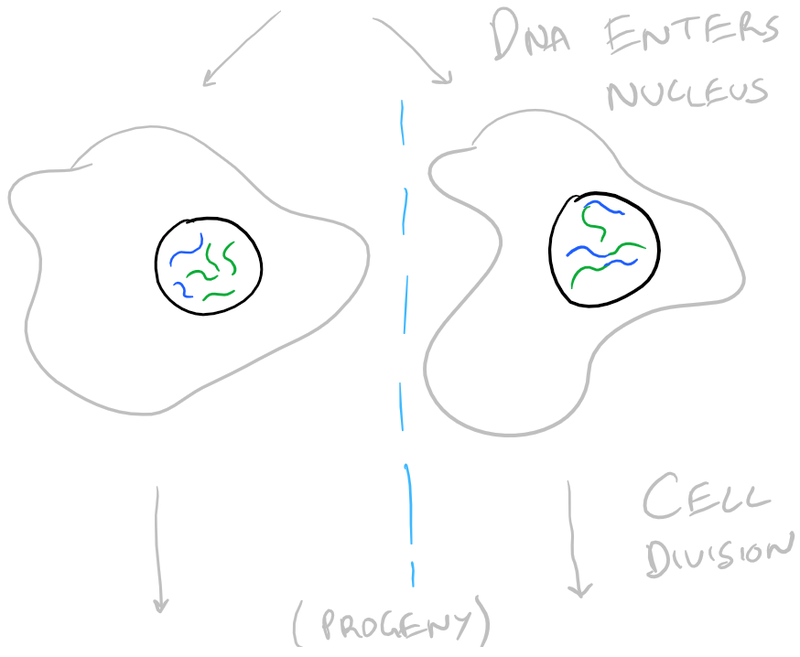 % Proliferation = dividing cells / (dividing cells+non dividing cells). 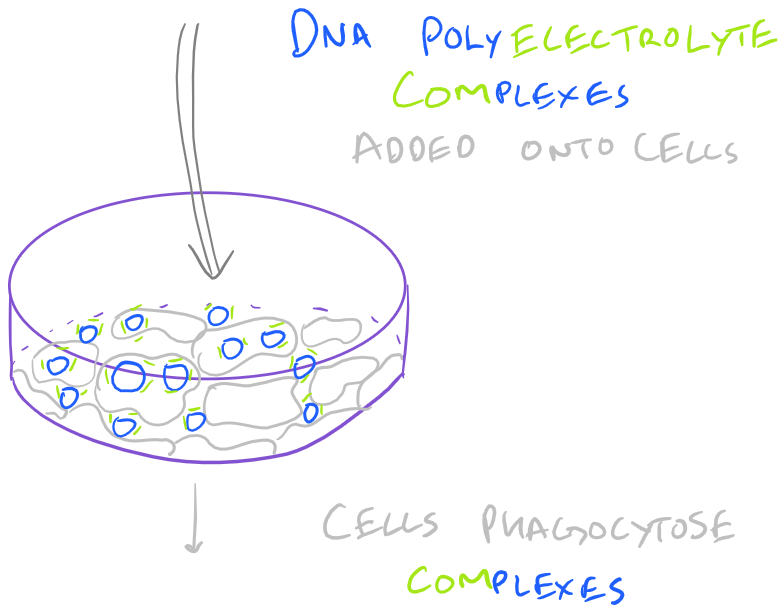 Cell Viability is a common technique used by biochemists who are studying oncology and pharmaceutics. The most common use for cell viability studies is when determining the IC50 for a cytotoxic compound in cell culture. However, as you can expect, there are a lot of different times when you need to know if your cells are alive. In larger pharmaceutical companies, MTT Cell Viability studies for Cytotoxic compounds are performed as a high throughput method because companies routinely screen MASSIVE libraries of small molecule drugs. To measure cell viability, researchers typically use an MTT assay, Cell Titer Blue, Trypan blue exclusion, or ATP assay. In this method guide, we will walk through the theory behind all these methods and then end with a protocol for the MTT assay. It would be a great test of your skills if you could use our High Performance Liquid Chromatography (HPLC) Method Guide to detect the products of the MTT assay. Then measure how much formazan was created using a spectrophotometer. Some researchers have even combined the use of the MTT assay with Flow Cytometry (FACS) to sort viable cells from non-viable cells. However, this is uncommon and there are much better stains for FACS such as Propidium iodide (PI). Cell Titer Blue: Similar to the MTT Assay, this assay involves incubating cells with resazurin (blue) and forming resorfurin (pink) after the cells metabolize it. Generally the metabolism takes 1-4 hours but it is much more sensitive than the MTT assay because you can measure the product via fluorescence (Ex/Em 560 nm/590 nm). The main advantage of this assay is that you don’t need to resolubilize the product in DMF/SDS so it’s much simpler. This is also a great high throughput assay! Trypan Blue Exclusion Assay: If you don’t have a spectrophotometer, then it’s simple to use the trypan blue staining method along with a microscope. Because trypan blue is a charged dye, it cannot permeate through living cells. 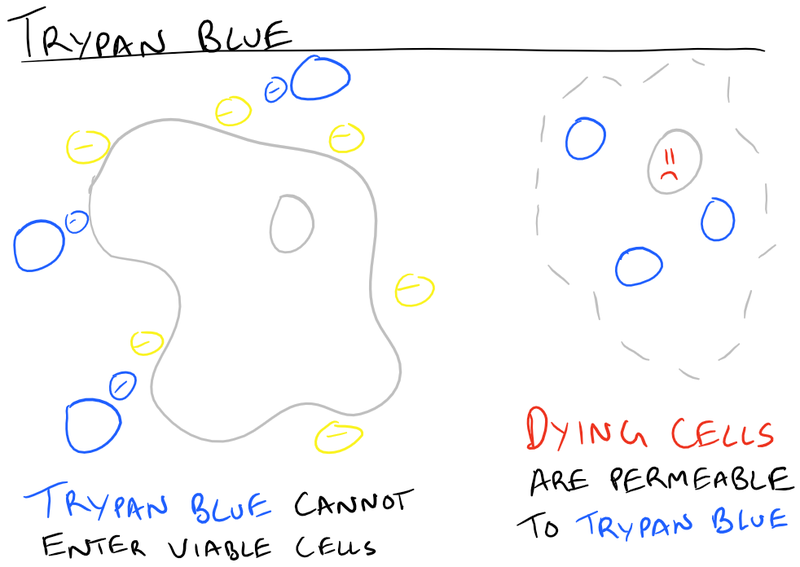 So, simply incubating cells with trypan blue and looking under a microscope allows you to visually determine the # of viable cells (unlabeled), # of non-viable cells (blue), and the # of damaged cells (slightly blue). Count the number of cells in different fields of view and you’re done! Viability is just the ratio of live cells divided by total number of cells. The disadvantage with this method is that all you test is the membrane integrity of the cells. You don’t know if the cells are truly non-viable or just damaged a little bit. ATP Assays: When cells are non-viable, they cannot make any more ATP whereas viable and happy cells can make ATP. Additionally, as soon as cells die, ATPases rapidly break down ATP. Using these bits of information, it’s easy to see why an ATP based assay would work really well. 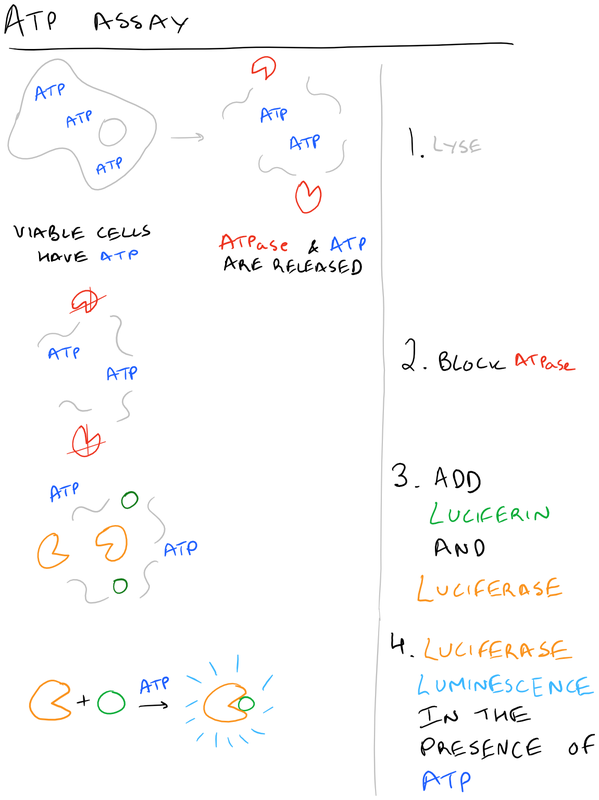 The theory is simple – lyse cells, stop ATPases from hydrolyzing ATP, add in Luciferase and Luciferin. You’ll get excellent luminescence signal for hours! Note: there are several other MTT-like molecules which are also used in cell viability assays: MTS, XTT, WST-1. The general principle however is all the same. The only note-worthy difference is that some of these molecules don’t penetrate live-cells, so they give you the reverse signal (how many dead cells there are). Make the above solutions. Store MTT solution protected from light at 4oC and make sure there is no precipitate in the Solubilization solution. Seed 25 x 103 Hep G2 cells in a 96 well plate with 250 ul of DMEM. Add your cytotoxic compound (5 uM for Doxorubicin). Incubate for a desired time period (24 hours for Doxorubicin). Aspirate media and wash 3x with PBS. Add 125 ul of DMEM with 25 ul of MTT Solution. Incubate for 2 hours at 37oC. Add in 100 ul of solubilization solution. Pipette gently to mix without creating bubbles. Measure via absorbance at 570 nm using spectrophotometer. Always set up positive and negative controls! For positive controls have cells untreated with any cytotoxic compound as part of your wells. For negative controls have cells treated with 3% SDS as part of your wells. Also, make sure to have wells that have no cells, only media. Too much MTT forms Formazan crystals which will damage cells so you might see the cells changing morphology. This is an end-point assay because the precipitate inside the cells will kill them. 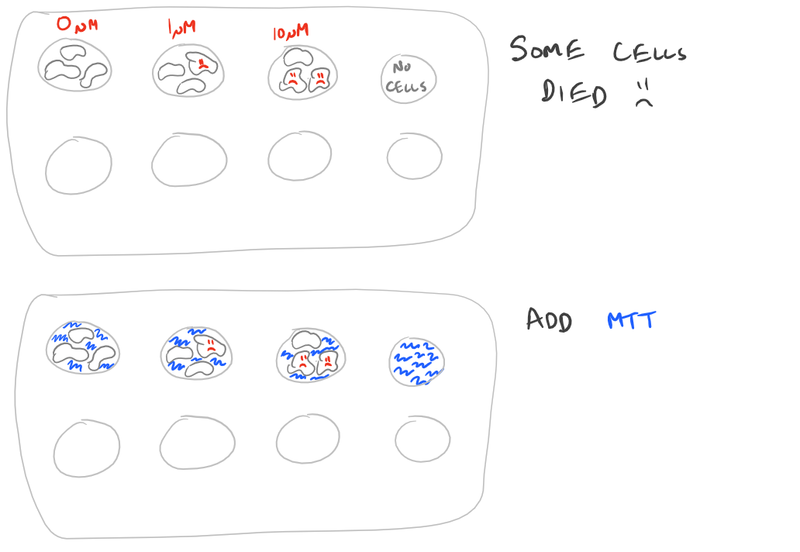 Don’t plan on keeping your cells alive for any further studies after you add the MTT. 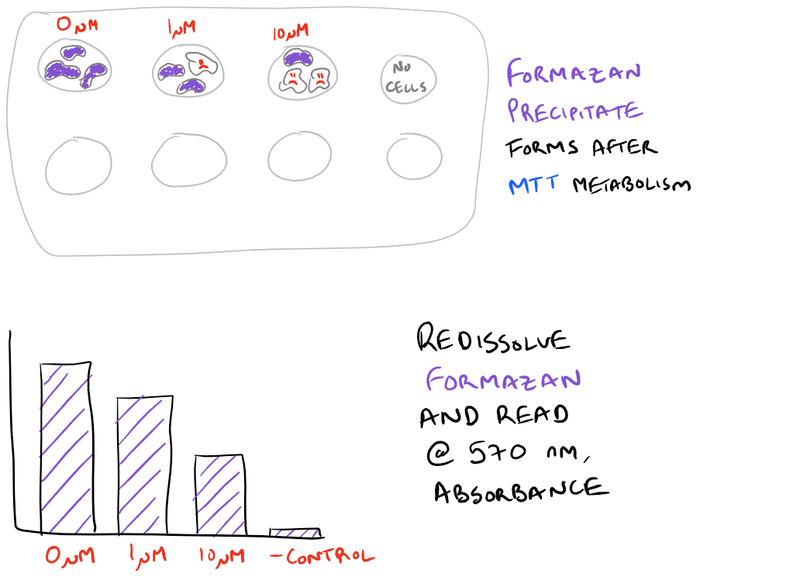 Having thiol-containing compounds in solution will convert MTT over to Formazan, so you’ll get false-positive data. Having phenol-red in your medium may also convolute your results. Dye-free media is important to use. Molecular biology tools allow us to understand and manipulate DNA/RNA so that we can change how cells behave. 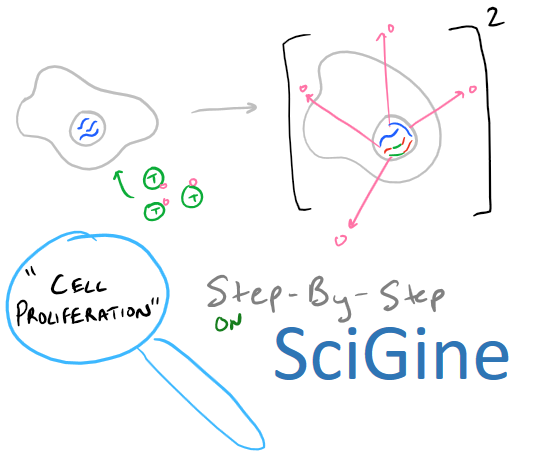 In this next series of posts, let’s learn how to manipulate cells and make them do our bidding. 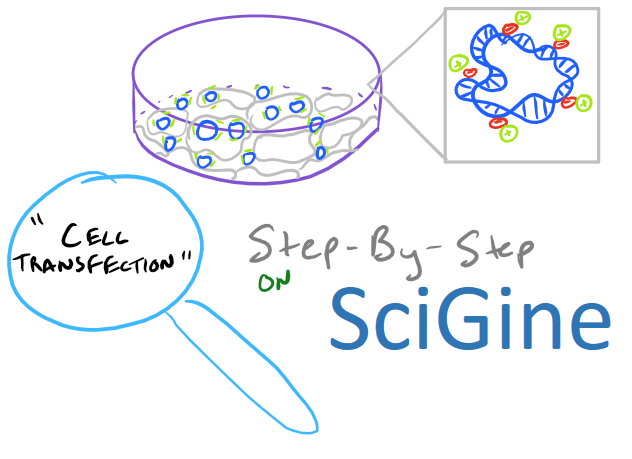 Among the list of methods to learn, the first tool to understand is transfection – the process by which we introduce new DNA into a cell so that we can change what proteins it creates. Specifically, we will focus on Calcium Phosphate transient transfection because it is a common and powerful technique. We can then combine transfection with some of our protein-manipulation techniques to change cell behavior and confirm that our changes actually had an effect: Immunoprecipitation (IP) and Western Blotting. Note that other techniques for transfection including electroporation, DEAE:Dextran based transfection, and lipid mediated transfection will be discussed in the future. Cells will tend to phagocytose the calcium phosphate nanoparticles and, with luck, they will allow the nanoparticles to enter the nucleus. 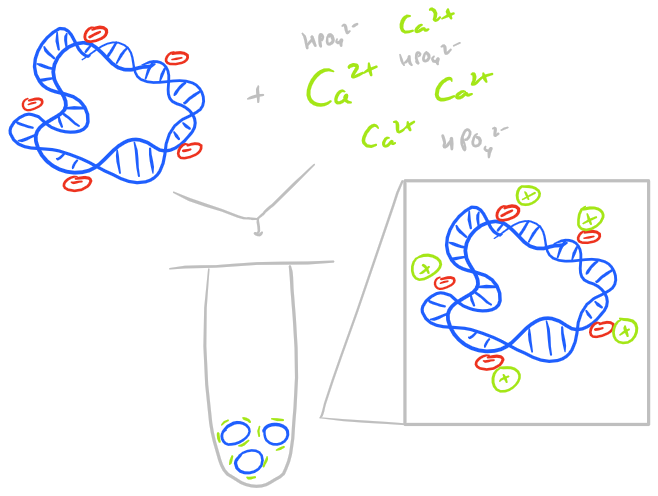 Calcium phosphate transfection works well because of the stability provided by divalent calcium ions. Other methods such as lipofectamine and polyethylene imine based transfection also work similarly by neutralizing DNA’s charge. But lipids offer the additional benefit of making the DNA complex more hydrophobic and hence make it easier for it to pass through the phospholipid bilayer. The pH of the solution: Even differences of 0.1 units will have drastic effects on the efficacy of your transfection protocol. Amount of DNA in the precipitate:Some cell types require a lot of DNA in the precipitate such as primary human foreskin fibroblasts. Others will tend to die instead of uptaking DNA, if you add too much DNA. 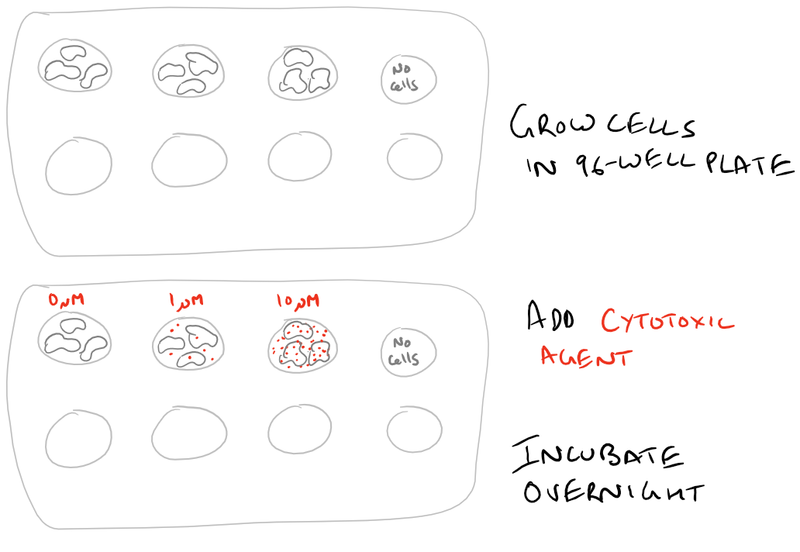 Incubation time with the precipitate:HeLa and 3T3 cells are relatively easy to transfect within 16 hours. 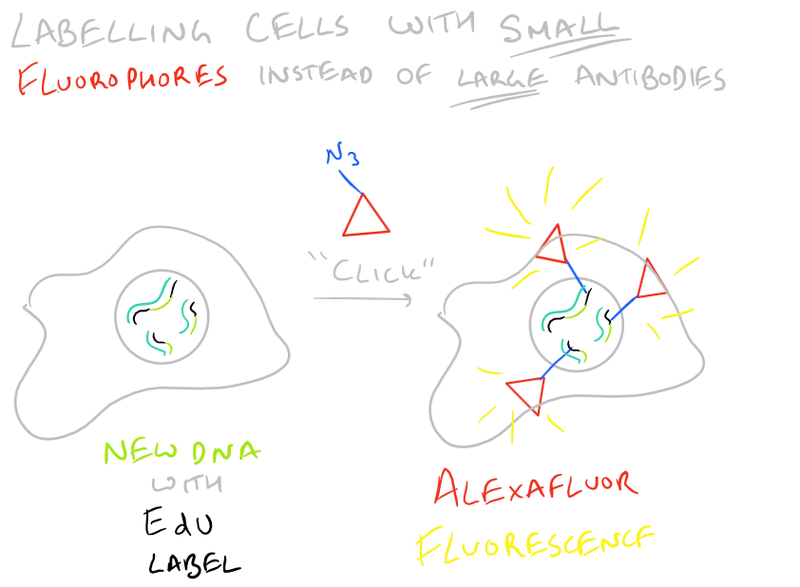 These cells can tolerate DNA nanoparticles for extended periods of time. However, other cell types may need shorter incubation times and may tend to apoptose if exposed too long. Additional glycerol or DMSO shock: It may be useful to “shock” cells with a 10% Glycerol solution or a 10-20% DMSO solution for a short time (~3 minutes). Carefully optimize this time for your particular cell type. Rate of Formation of DNA nanoparticles: High efficiency transfection techniques have been discovered whereby buffers like BBS allow DNA nanoparticles to form slowly and precipitate onto cells. When this happens, cells tend to phagocytose more of the adducts and tend towards higher viability/less toxicity. To make sure that your DNA is being incorporated into cells, you should include a reporter plasmid such as one with neomycin resistance (neo). You will need to optimize the ratio of neo reporter DNA vs. the DNA you want to include. Split cells such that there is space between cells. Dry DNA after aspirating supernatant from ethanol. Use air to make sure it is completely dry. Add the DNA/CaCl2 solution dropwise to this tube while agitating with a stir bar or other mechanism. Spread the precipitate over the cells along with their medium . Shake gently to make sure the precipitate is even. Remove medium, wash twice with PBS, and feed cells with complete medium. Plate cells in selective medium. Mix 20-30 ug of DNA with 500 ul of 0.25 M CaCl2 stock. Add 500 ul of BBS to this mixture and vortex. Incubate at room temp for 20 min. Add this mixture to the cell culture dish dropwise and mix by gently shaking the plate. Incubate cells overnight for 24 h at 3% CO2 at 35 oC. Wash cells 2x with PBS and then incubate them in complete medium for 2 doublings. 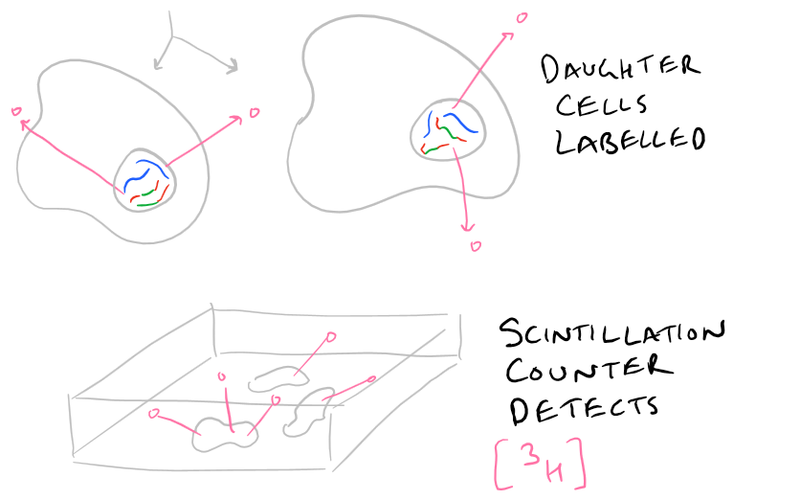 Split cells and incubate in selection media. Cell density has to be low but not too low. The ideal cell density allows you to reach confluence at the end of the transfection period without making the media acidic. 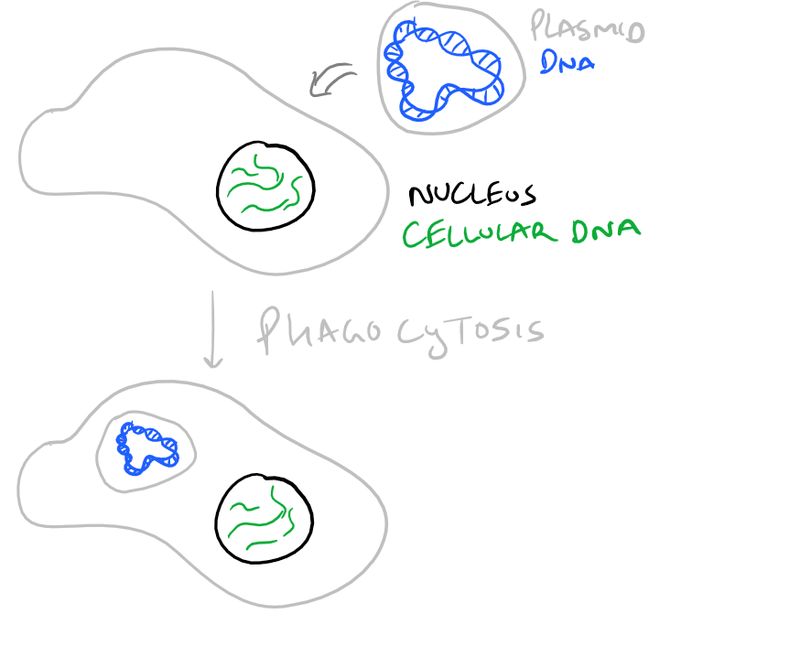 Also, space between cells increases transfection efficiency because DNA phagocytosis is proportional to exposed surface area of cells. For some cells, incubate with 10% glycerol or 10-20% DMSO for 3 minutes, and wash twice with PBS, prior to adding the DNA nanoparticles. This may increase your transfection efficiency. However, for the BBS method, this step is not necessary because it will not affect cell transfection efficiency. Supercoiled DNA and plasmid DNA works best with these procedures. 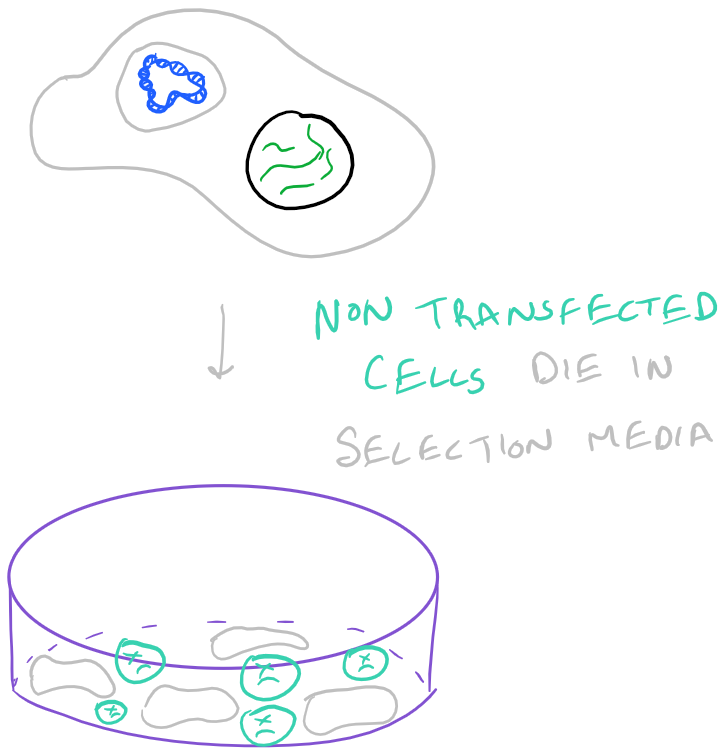 Depending on the plasmids that you introduce into cells, your selective medium will vary. pH is EXTREMELY CRITICAL for transfection procedures. At the end of the transfection, pH of your medium should be alkaline at 7.6, but prior to the procedure, make sure all your buffers are clean and at the right pH. All buffers above may be frozen and stored as aliquots. But it is important to make sure that your pH is correct prior to using freshly thawed buffers. Calcium Phosphate Transfection by Kingston et al. High Efficiency Transfection by Chen et al. Transfection Review by Kim et al.